Our District 6 Crime Report for the month of September is at 96 incidents. This puts us slightly below where we were this time last year, and significantly below where we were in 2016. If we keep this trend of below 100 incidents a month continuing we will come in lower than the last two years. This is what we want to see for our area. By working together and all being vigilant of what goes on in our neighborhoods, our parks, businesses, etc. crime may be reduced. Remember – if you see something that does not look right to you, call 911! A couple of our neighborhoods have been invited to participate in a Multi-Neighborhood Crime Watch Meeting. This is a great way to learn more from IMPD about how to keep yourself and your property safer and less likely to be a victim of a crime. It gets to know neighbors better and encourages people working together. Kim Taylor is our Crime Watch Specialist and she would be delighted to set up more Crime Watch Meetings – for individual neighborhoods or for neighborhoods that would like to get together with adjoining neighborhoods. Kim Taylor’s contact information is: Kim.Taylor@indy.gov or 317-327-6572. Once you have something set up with her, I would be glad to help you get the word out to your neighborhood about your Crime Watch Meeting. 1.) Days are getting shorter and it gets dark much quicker – make sure you have outside lights on at dusk. If you have timers, now is the time to check and make sure they are coming on at the right time. If you don’t have timers, remember to turn on your lights when it starts to get dark. 2.) As it gets cooler many folks are tempted to start their cars in the morning. Notice the number of stolen vehicles on the map (I counted 15 last month). We don’t want to see that number rise. Don’t make it easy for someone to steal your vehicle by having it warming up in the driveway. 3.) Along with not leaving a running vehicle in the driveway, make sure your vehicle is always locked. Best to keep it in a garage, but if that is not possible make sure that it is locked and that nothing of value is left in the vehicle. 4.) As we are working out in our yards (soon raking leaves), don’t leave your garage door open or your house unlocked when you are not right there. It can take only a few seconds for a thief to make a quick grab of something in your garage, or to walk into a house and walk off with something of value. Remember – word spreads among those who commit crimes. If a criminal notices lights not on in a neighborhood, cars running and no body in them, garage doors open, or items (bikes, tools, etc.) 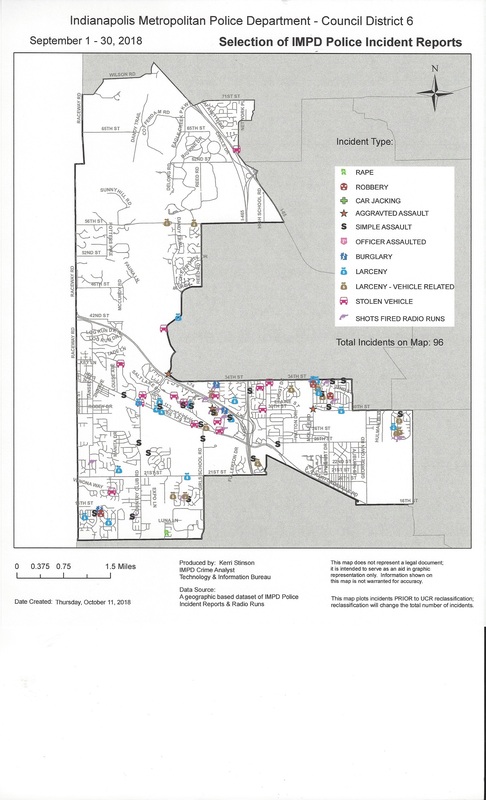 left unattended outside – these are neighborhoods that are attractive to them. They, and others, will be back. Never hesitate calling 911 if you see or hear something that does not seem right to you. Please feel free to share this information with others in our district who may not be on my email list.